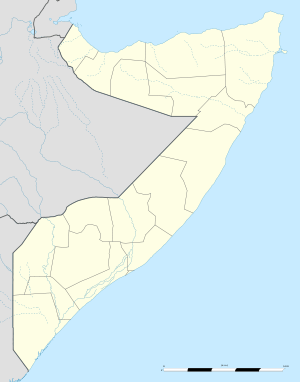 Amud or Amoud (Somali: Amuud, Arabic: العامود‎‎) is an ancient, ruined town in the northwestern Awdal region of Somalia. It was a center of activity during the Golden Age of the Adal Sultanate. The archaeological site is situated 1,000 metres (3,300 ft) above sea level, around 4.5 km northeast of the regional capital Borama. The old section of Amud spans 25 acres (100,000 m2) and contains hundreds of ancient ruins of multi-roomed courtyard houses, stone walls, complex mosques, and other archaeological remains, including intricate colored glass bracelets and Chinese ceramics. According to Sonia Mary Cole, the town features 250 to 300 houses and an ancient temple. The temple was constructed of carefully dressed stone, and was later transformed into a mosque. It also features pottery lamps. Altogether, the building techniques, among other factors, point to a close association with Aksumite archaeological sites from the 2nd to 5th centuries CE. Amud is home to several historic pilgrimage sites belonging to celebrated Somali Saints, the most prominent being Saint Sau, Saint Amud and Saint Sharlagamadi. During his research in the area, the historian G.W.B. Huntingford noticed that whenever a historic site had the prefix Aw in its name (such as the ruins of Aw Bare), it denoted the final resting place of a local Saint. The Amoud University in Borama is named after the archaeological site.